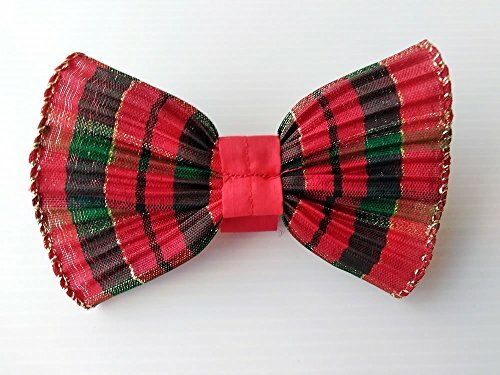 Fancy Ribbon Dog Bow Tie in Glittery Red and Green Scottish Holiday Plaid by puranco inc at Nicky's Blog. Hurry! Limited time offer. Offer valid only while supplies last. Give your pet something to woof about. This bow is made with fancy glittery ribbon reinforced with machine stitching. All sewn in, nothing glued. Give your pet something to woof about. This bow is made with fancy glittery ribbon reinforced with machine stitching. All sewn in, nothing glued. This bow is in kilt inspired Scottish Plaid ribbon with gold glittery accents. Hook and Loop Fastener Closure is attached at the back. Easy on. Easy off. Just peel off the fastener and attach it to the collar and your pet is dressed to impress. Hand washing recommended if needed because of the glitters. Can be used for Christmas, St Patrick's Day or Valentines Day.